Live blogging the Google hangout with BJP leader, and leader of the opposition in the Rajya Sabha, Arun Jaitley. Welcome to our hangout with BJP leader, leader of the opposition in the Rajya Sabha and BJP Lok Sabha candidate from Amritsar, Arun Jaitley, scheduled for 5pm today. During the course of the hangout, Mr Jaitley will talk about his and his party's vision, the election and will also take questions from participants. We will be live blogging the key highlights from his speech. Responding to a comment from Vishal, on the hangout, Jaitley says that he is in favour of GST, and added that the BJP would make implementing it a top priority. Jaitley added that implementing it would require a constitutional amendment and that a future BJP government would work with state governments to make it a reality. He said that the failure of the UPA government was that they did not inspire enough confidence in the state governments. No matter how long it takes to complete we have to start the smart cities model, Jaitley said. This is in addition to suburbanisation. Jaitley was responding to a question on over congestion in metros and the need to build other hubs in India. We are under threat so cyber world could be an easy target; protecting it is of highest importance, said Jaitley in response to a question, despite admitting that he is not an expert on the issue. However he said that it would be to India's detriment to ignore the importance of such an important issue, which other world governments have been focusing on. Arun Jaitley has said that another fractured mandate would be disastrous for India, and said that this was why the BJP had a very clear target of 272, so that such a situation would be avoided. 'Any party that has to depend on the Aam Aadmi Party for a government is an unstable government", he warned. Jaitley also said that he did not agree with AAP's politics of seeing scams everywhere, and their policy of taking on corporates just because they were the front runners in any particular field. Some humour from the host Rajdeep Sardesai: Mr Jaitley, my fear is that you will be contesting from the food capital, eat too many kulcha, not enough channa and your cholesterol will increase! What is your vision for India, if you are given additional responsibility as a Dy. PM? What is your priority? What will be the NDA policy on personal tax, which is very high and slabs are also irrational. Arun Jaitley is now talking about FDI in retail, and is sticking to his stand that the time is not yet right for such a move. "It is not just the loss of retail jobs, but also the manufacturing sector. There need to be many more internal reforms before such a step can take place", he said, adding that there would be Indian stores selling fancy Chinese goods, owned by Americans, with Indians as salesboys and girls. Jaitley is now talking about the long delays in the justice system. There are much more cases in the country now than 10 years ago, he said. "I think you will have to go back to the commonsense solution of having more judges in India." Jaitley suggests an increase of 10% of judges every year, saying that you have to start now about doubling the judicial capacity in India. "It is not fair to ask one judge to look at 60 cases a day and then say why are you taking so long", he said. An all India Judicial system is only possible within a state, but on an all-India level it can be a problem, he said. Jaitley also admitted that the Judicial commission was a good idea by the government, but said that the manner in which the government went about it, not introducing it before a standing committee was wrong. "It is ridiculous that you would attempt to do this with a constitutional amendment of this magnitude", he said. "We cannot remain with 4% growth rate - we have to regain 8-9% growth"
"People are tired of all the corruption and scams", he said. 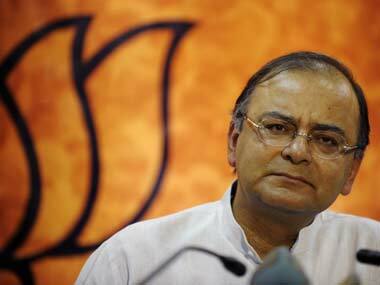 The big question: Is Arun Jaitley asking for a vote for the BJP or for Narendra Modi? - The big Rajdeep Sardesai question to Jaitley. If we have a charismatic leader who can get more votes for a BJP led NDA government, why should I not canvass for Modi? asks Jaitley. What will be NDA stand on Personal Tax. Will you reduce the tax rates? and modify the Slabs? Jaitley laughs off Jaswant Singh's objections to BJP becoming a 'one man party': I would have believed him if he even said this a week earlier. Now, I find it hard to digest. You can still watch the entirety of the chat, in the video on this page.